Kerry asks: Did an apple really fall on Newton’s head? In grade school you probably learned Newton’s apple story around the time you learned that George Washington chopped down a cherry tree, that people in Columbus’ time thought that the world was flat, or that the Pilgrims celebrated the first Thanksgiving in America and invited the Native Americans to join them. Since literally none of the latter three stories here are true (follow the preceding links for full details), you probably have your doubts about whether Newton actually sat under an apple tree and had something of a “eureka” moment concerning gravity. It might surprise you to learn, then, that your teachers got one of these stories (partially) correct. Newton was indeed sitting under an apple tree when he had his so-called “eureka” moment on how gravity worked. Although, it took him over two decades more to develop the fully-fledged theory of “universal gravitation”, first published in his Philosophiæ Naturalis Principia Mathematica on July 5, 1687. He also didn’t complete it without some ideas others had already come up with, such as Christopher Wren, Robert Hooke, and Edmond Halley (who Halley’s comet is named after); though Newton claims particularly Hooke, who corresponded heavily with Newton on gravity, and his ideas had little real bearing on his work, other than simply to inspire him to continue working on the problem. So perhaps “eureka” conveys much too strong of a leap. From accounts, he was more just put on the correct path while musing under the tree. Further, it would seem that the apple didn’t fall directly on his head- at least there is no documented evidence of this. But if you discount the notion that he near instantly fleshed out his universal theory and the “fell on his head” bit, the common story is pretty accurate. One of the best sources we have for the “apple falling on Newton’s head” anecdote is a manuscript written by Newton’s friend William Stukeley. He published Memoirs of Sir Isaac Newton’s Life in 1752, becoming one of Newton’s first biographers. Many of the incidences described in the book were recorded much earlier than 1752, including the “apple” story which was first documented in 1726, the year Newton died, and then again a year later by Voltaire in his Epic Poetry. After dinner, the weather being warm, we went into the garden, & drank tea under the shade of some appletrees, only he, & myself. amidst other discourse, he told me, he was just in the same situation, as when formerly, the notion of gravitation came into his mind. “Why should that apple always descend perpendicularly to the ground,” thought he to him self: occasion’d by the fall of an apple, as he sat in a contemplative mood: “Why should it not go sideways, or upwards? but constantly to the earths centre? Assuredly, the reason is, that the earth draws it. There must be a drawing power in matter. & the sum of the drawing power in the matter of the earth must be in the earths centre, not in any side of the earth. therefore dos this apple fall perpendicularly, or toward the centre. If matter thus draws matter; it must be in proportion of its quantity. Therefore the apple draws the earth, as well as the earth draws the apple. In the year he retired again from Cambridge on account of the plague to his mother in Lincolnshire & whilst he was musing in a garden it came into his thought that the same power of gravity (which made an apple fall from the tree to the ground) was not limited to a certain distance from the earth but must extend much farther than was usually thought – Why not as high as the Moon said he to himself & if so that must influence her motion & perhaps retain her in her orbit, whereupon he fell a calculating what would be the effect of that supposition but being absent from books & taking the common estimate in use among Geographers & our sea men before Norwood had measured the earth, that 60 English miles were contained in one degree of latitude his computation did not agree with his Theory & inclined him then to entertain a notion that together with the power of gravity there might be a mixture of that force which the moon would have if it was carried along in a vortex, but when the Tract of Picard of the measure of the earth came out shewing that a degree was about 69.12 English miles He began his calculation a new & found it perfectly agreeable to his Theory. The “year [Newton] retired again from Cambridge” was 1666, which means Stukeley’s recording of the event took place some 60 years after it happened. However, both Stukeley and Conduitt, among others, appear to have independently heard the story directly from Newton himself, making it reasonable to believe a falling apple was, indeed, the source of Newton’s first significant musings over how gravity works. There are many different places which claim to be the home of the apple tree that inspired Newton’s theory, but the most likely one—given the accounts—is located at his family home of Woolsthorpe Manor near Grantham, UK. And, yes, there is an apple tree there today that is thought to be the apple tree in question, though it has re-rooted in the interim after being knocked over in a storm in 1890. 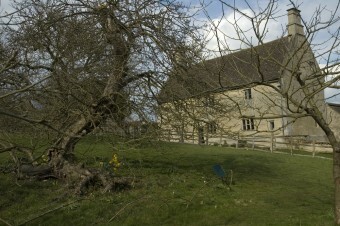 Now around 400 years old, the tree and the property are protected by the National Trust. If you’re curious, the tree is a Flower of Kent, which doesn’t produce very good apples for eating by today’s standards, though they are considered good cooking apples. Further, the apples in question are green, not red as is often depicted in Isaac Newton/apple images. You’ll note, of course, that Stukeley above stated there was more than one apple tree there at the time; so whether this remaining one is “the” apple tree is a question can’t be definitively answered until someone invents a machine that can take us back in time to observe the event. That being said, Dr Richard Keesing from the Department of Physics at the University of York makes a pretty good case for why it probably is the correct tree. Despite this uncertainty, there are a many trees that have been started as grafts from the Woolsthorpe tree, including one at Trinity College in Cambridge which sits beneath the window of the room Newton used when studying there. Astronomer Alexis Clairaut in 1727 commented on Hooke’s accusations that Newton stole Hooke’s work, summing up the situation nicely: “One must not think that this idea … of Hooke diminishes Newton’s glory… the example of Hooke [serves] to show what a distance there is between a truth that is glimpsed and a truth that is demonstrated.” Essentially, Hooke guessed at a notion that Newton was able to prove. Besides the above references to who Newton told the “apple tree” story to, two others also gave an account of him telling the story to them: Catherine Barton (his niece) and Christopher Dawson (a student at Cambridge). It isn’t clear whether Voltaire heard the “apple” story from Newton himself or if he was told it by a mutual friend or found out about it in some other manner. That said, the pair were friends or at least acquaintances, depending on your definition of “friends”. Voltaire was even present at Newton’s funeral. In 1976, Apple Computers briefly used a logo that featured Sir Isaac Newton sitting beneath an apple tree. It was designed by Ronald Wayne, a lesser-known co-founder of the company. Apple later changed the logo to the more recognizable rainbow apple with the bite taken out of it. Newton has been commemorated in many different ways. Perhaps one of the larger monuments to his genius is a statue by Eduardo Paolozzi which stands near the British Library in London. The statue is based on an etching of Newton by William Blake. William Stukeley, Newton’s biographer, had quite the resume himself. In addition to being a doctor, he had a key interest in historical monuments and is perhaps best known for his excavation of Stonehenge. He was the first person to recognize the alignment of Stonehenge on solstices and attributed the iconic landmark to the druids. He later became a vicar, had a keen interest in Robin Hood, and wrote music for the flute. Mercury was found in Newton’s hair when it was examined after his death, likely a result of his experiments in alchemy. Newton was the second scientist to be knighted, though it’s thought he was granted knighthood for political reasons rather than his achievements. He was knighted in April 1705, over 100 years after the first knighted scientist, Sir Francis Bacon, was given the honour in 1603. The value of “G” in Newton’s famous “universal gravity” equation wasn’t accurately determined until 71 years after Newton’s death and 111 years after he published the equation.